As mentioned by Mikatan previously, Nendoroid Yuzuriha Inori is ready to be pre-ordered starting today. The young heroine who expresses herself through song. 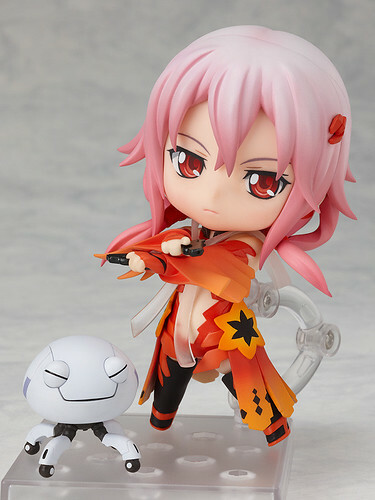 From the anime series, ‘Guilty Crown’ comes a Nendoroid of the Undertaker’s member, singer and heroine of the series, Inori Yuzuriha. She has been sculpted wearing the lovely red and orange outfit from the series! Inori comes with a wide selection of optional parts, letting you pose her peacefully making a Cat’s Cradle from string, or instead holding two pistols and ready to bravely fight against her enemies. She even comes with special Void Effect Parts that allow you to pose her as if her void was being taken out. For even more fun, she also comes with the little robotic helper, Funell! A wide variety of parts that will allow Inori fans to pose her however they think she looks best! This entry was posted in News and tagged guilty crown, nendoroid, yuzuriha inori. Yes, I have heard a lot about this anime and it is highly recommended by my friends as well.